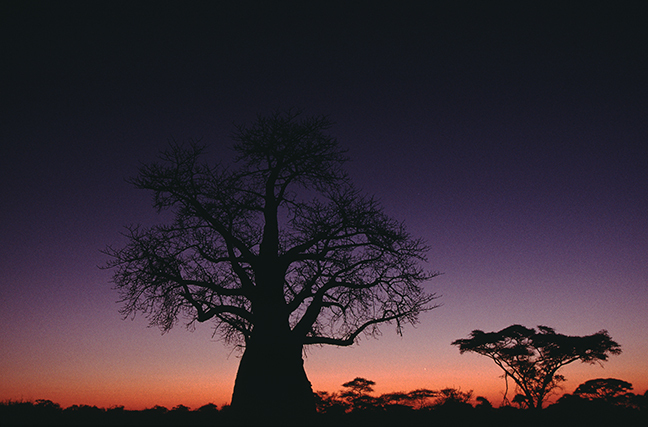 The sun rises behind a Baobab Tree on Chief’s Island within the Moremi Game Reserve in the Okavango Delta of Botswana. Baobab trees occur in seasonally arid habitats and are deciduous. They can store more than 25,000 gallons of water in their trunks, allowing them to endure harsh droughts. A Spotted Hyena threatens to steal scraps from an African Wild Dog in the Linyanti concession between the Okavango Delta and the Caprivi wetlands. 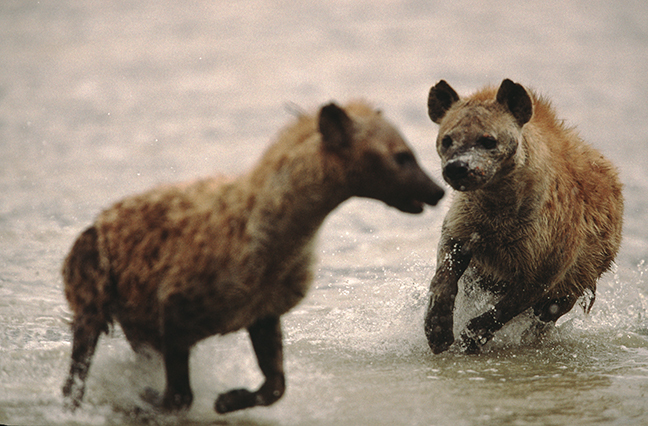 Hyenas are opportunistic feeders and will often follow other predators and try to steal their kills. 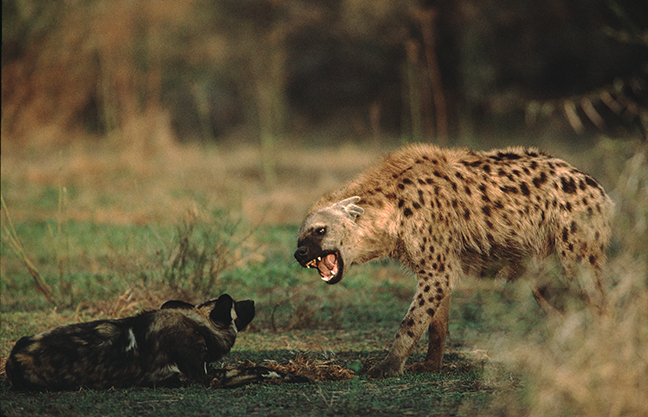 A solitary hyena usually won't fair well against a pack of wild dogs. 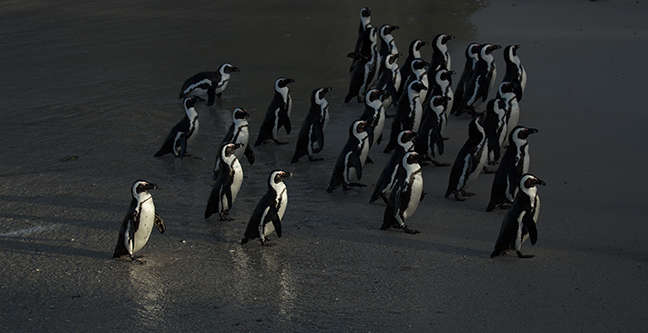 African Penguins return to Foxy Beach in Simon's Town on the Cape Peninsula in South Africa after fishing. When fishing, African Penguins regularly dive almost 100 feet and stay under water for two to three minutes. Each foraging trip, on average, covers anywhere from 18-50 miles. 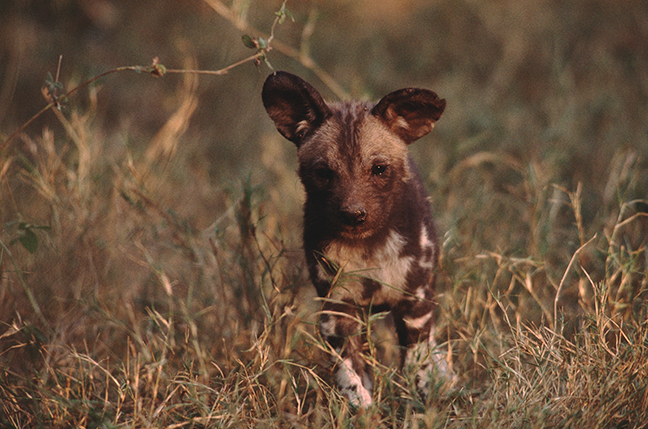 An African Wild Dog pup romps around a denning site on Pom Pom Island. When rearing young, a pack adopts the den as a base. For the rest of the year, they roam, rarely spending more than a day in one place. When pups are present at a kill, they feed first. When not, members of the pack regurgitate food to feed them. 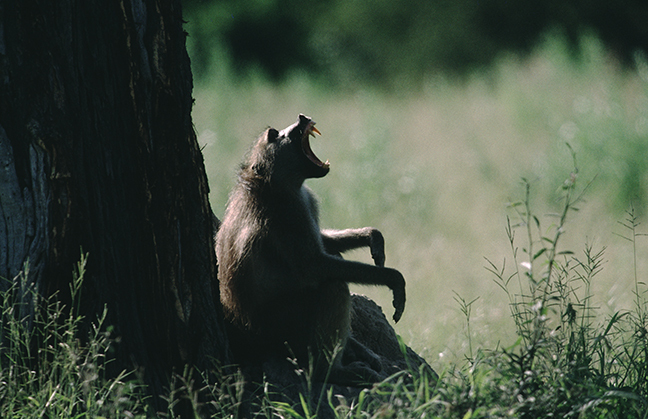 A Chacma Baboon emits a loud screeching call while baring her canine teeth in the Okavango Delta region of Botswana. Baboons spent most of their time walking on all fours and usually only retreat to trees to sleep. They are excellent climbers, but their tails are not prehensile, so are used only to assist with balance during climbing. 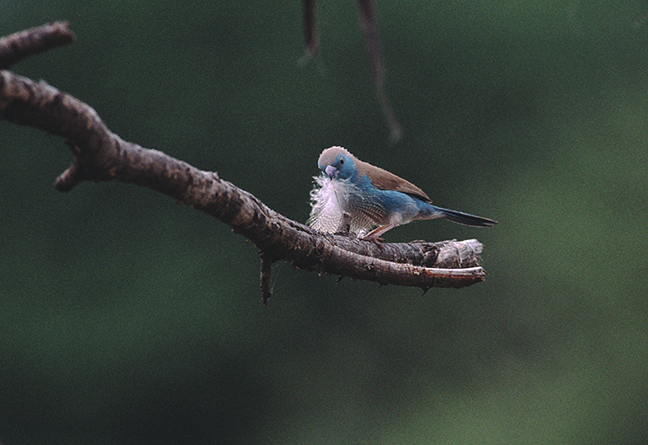 A Blue-breasted Cordon-bleu Waxbill gathers nesting materials in the Okavango Delta. Waxbills feed on both fruits and insects and prefer savannas, low grasslands or acacia woodlands. Two yearling cheetah cubs play fight in the Serengeti. Cubs stay with their mother for the first 18 months to two years or their lives. There are more than 1,500 cheetah living in Serengeti National Park, a World Heritage Site in Tanzania. 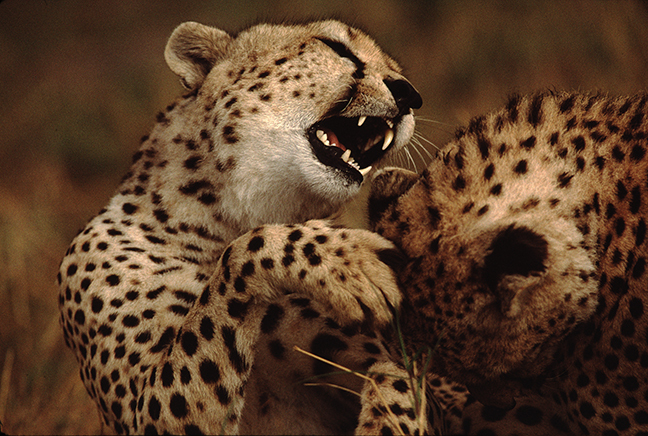 The Serengeti Cheetah Project, initiated in 1974, was one of the first and is still one of the most significant cheetah research projects in the world. A Cape Buffalo emerges from a muddy water hole in Addo Elephant National Park. 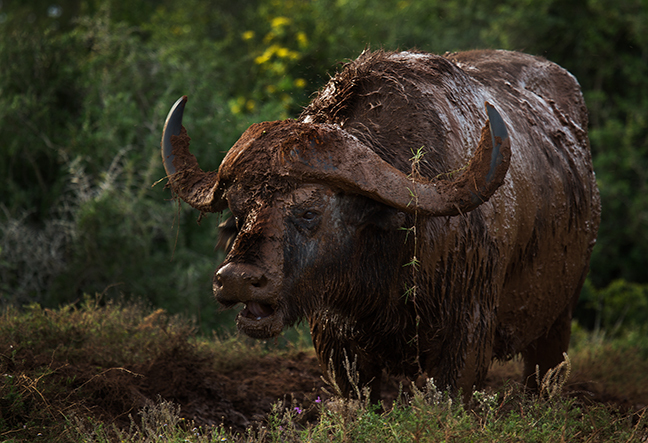 Buffalo cover themselves with mud to regulate their body temperature and to eliminate parasites and ticks. When the mud dries and peels away, the embedded irritants are removed with it. A male lion snarls as dusk settles over the Langeberg and Outeniqua Mountains in the Western Cape of South Africa. 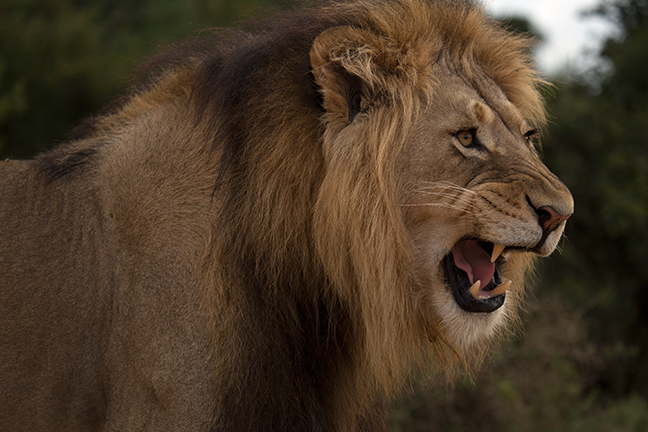 Males defend the pride's territory, which may include up to 100 square miles. They mark their borders with urine and vocalize intimidatingly to warn and fend off intruders. A young Black Vervet Monkey hides in a Thorny Acacia Tree while his mother collects food. 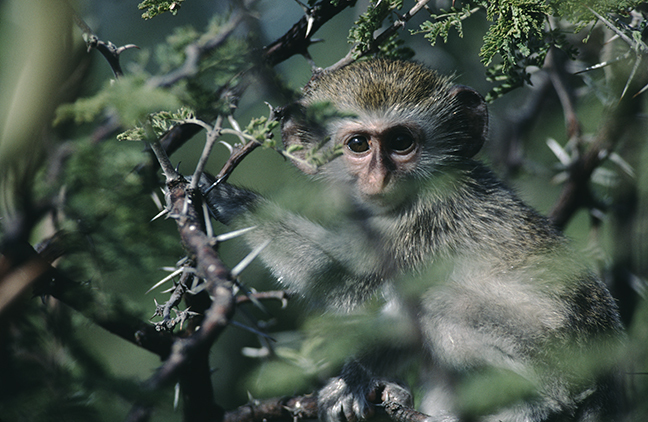 Vervets are primarily herbivorous, preferring fruits, leaves and seeds. Leopards, eagles, pythons and baboons will all hunt young vervets. 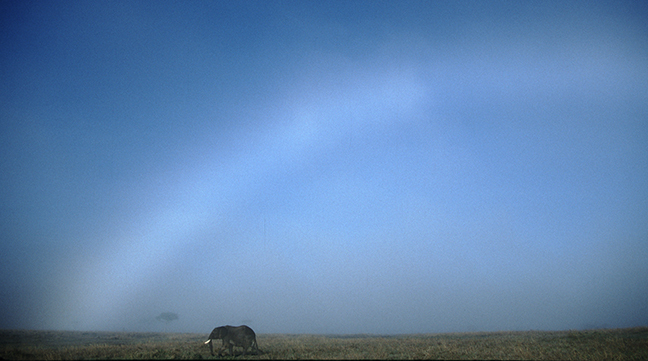 An elephant walks through the Masai Mara under a fogbow, also known as a white rainbow. Fogbows form when there are small water droplets inside a fog or cloud and the sun is low in the sky. Because the droplets are small, fogbows have little or no color. 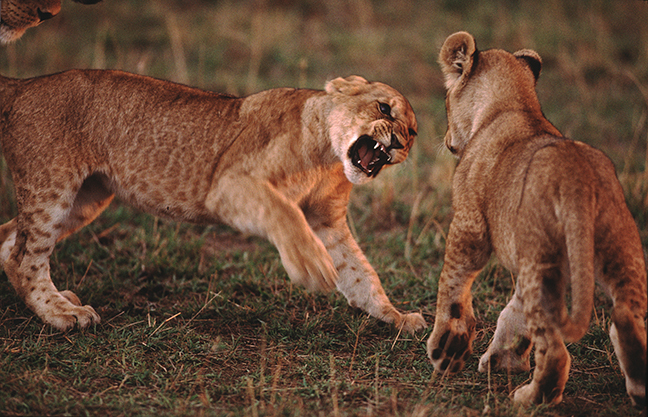 Lion cubs play in the Selous. Cubs are born with brown spots on wooly coats that they retain for about five months. Less than half of cubs survive to be a year old and four out of five die from animal attacks or starvation by the time they are two. 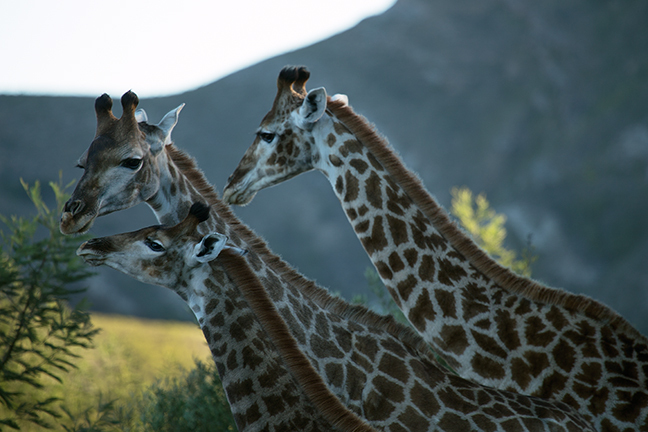 Giraffes browse in the Nauga Valley against a backdrop of the Langeberg Mountains in the Gondwana Private Game Reserve. Giraffes use their prehensile tongue to remove new growth from the tops of trees. They are herbivores and can eat hundreds of pounds of leaves per week. 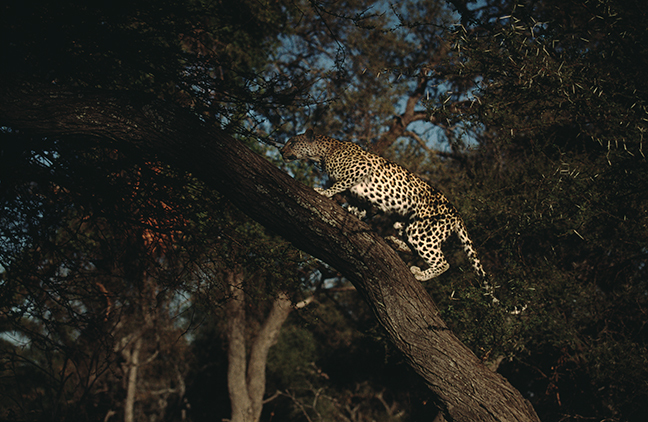 A leopard climbs a tree on Chief's Island in the Okavango Delta. Their ability to climb provides safety from predators. Leopards are solitary and largely nocturnal. They are opportunistic hunters with a broad diet. They primarily feed on ungulates and primates, but also will eat rodents, reptiles, insects and birds. A male Greater Kudu grazes in Limpopo Province, South Africa. 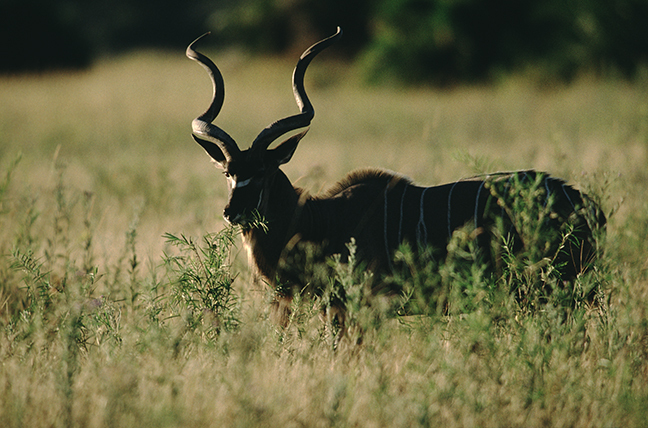 Kudu are highly sought after by trophy hunters and there are no seasonal restrictions on hunting Kudu bulls in South Africa. Bulls are solitary and will only join groups of females during the fall mating season. 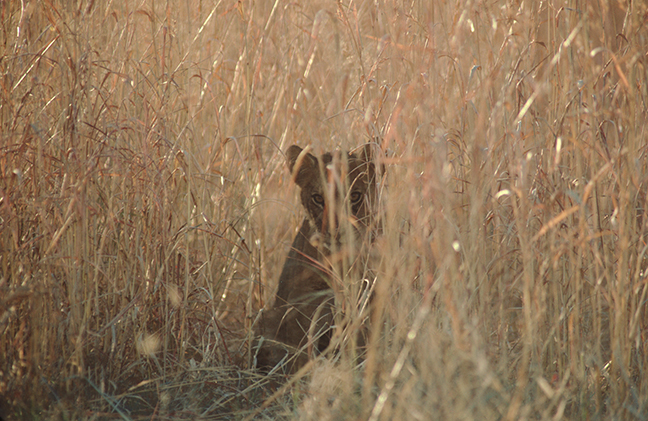 A young lion cub hides in the tall grass in the Masai Mara. The Mara has come to symbolize everything that is wrong with wildlife safari tourism. In the past 30 years wildlife populations have crashed by up to 70 percent, according to a Journal of Zoology study, while cows grazing illegally inside the reserve were up 1,100 percent. Every sighting draws 30 or more minivans now that drivers announce sightings on their radios. A female Spotted Hyena chases a male away from a kill in the Masai Mara. A Spotted Hyena society is matriarchal. The females are much larger than males and dominate them. They live in large clans of up to 70 animals and hunt either alone or in small groups. They also scavenge and will steal prey from larger predators. A Greater Flamingo feeds in a mud flat at Addo Elephant National Park, Eastern Cape, South Africa. They feed by sucking up mud and water and their beak filters food from the water. Flamingos are grey at birth but gradually turn pink due to the natural pink dye called canthaxanthin that they digest from their diet of brine shrimp.